Though thin and partially translucent, tooth enamel is the hardest substance in the body. It has the essential job of protecting teeth from constant use and the continual assault of chemicals in food and drink. But at Dennis J. Coleman DDS, your dentist in Davidson NC, reminds you that enamel also safeguards tooth nerves from hot and cold food and beverages. That’s why enamel loss often causes tooth sensitivity. Cuts heal. Bruises fade. Broken bones mend. The body’s ability to heal itself is truly incredible. But tooth enamel is different. When it’s gone, it’s gone. It may seem counterintuitive, and not what you’d expect to hear from a dentist. But sometimes it is better NOT to brush immediately after eating. Specifically, after eating anything acidic. 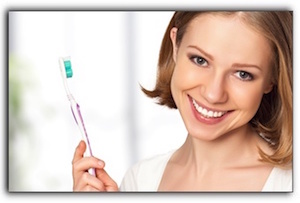 The acid weakens the enamel, which can be further weakened by brushing. Waiting an hour will allow the acid to dilute. Rinsing immediately after eating acidic foods is a good idea, however. Rinsing washes away some food particles and speeds up the dilution of the acid. Some people don’t realize that dry mouth can cause or exacerbate enamel erosion. The calcium and phosphate in saliva safeguards your enamel. When there is little saliva, the enamel is left vulnerable. Chewing sugar-free gum and sipping water periodically can stimulate saliva production between meals without increasing your calorie intake. If you sip soda, tea, or coffee all day, we suggest you switch to water to halt any enamel erosion that has already transpired. It may be a hard change to make, but if you are successful, your teeth will thank you for it. If you have already experienced enamel erosion or other dental issues, Dennis J. Coleman DDS, your dentist in Davidson NC, can help you protect what is left. We provide general and cosmetic dentistry, and treat conditions like gum disease and TMD. Call our office to schedule an appointment.